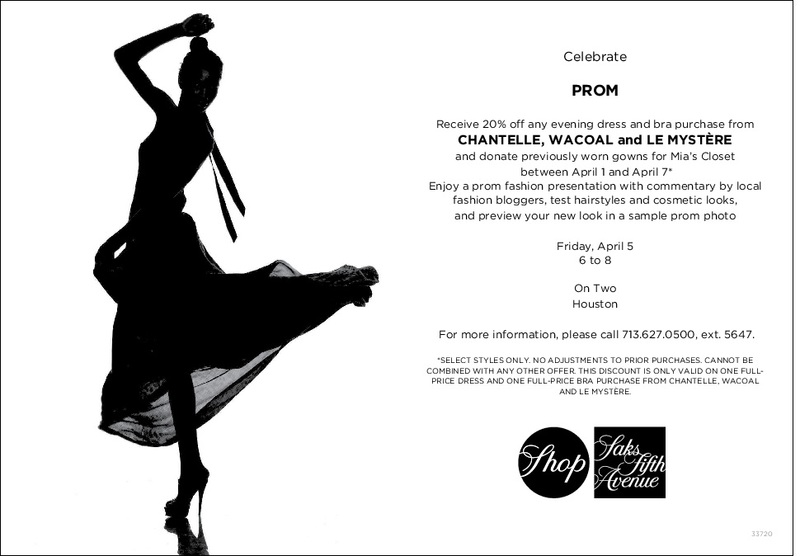 Mia’s Closet & Saks Fifth Avenue partner to give back this prom season! It is an absolute honor to announce that Saks Fifth Avenue Galleria Houston will be hosting a donation drive for prom dresses for Mia’s Closet! We will be benefiting the young ladies of Lil Audrey’s Safe Place. Lil Audrey’s Safe Place Foundation is a safe environment within a transitional homeless facility and emergency shelter that houses alumni of the foster care system seeking a Post Secondary Education. Many of their residents would not be able to attend prom without the outside support of donors, so we are thrilled to be a part of this! Donations can be dropped off at the Saks Fifth Avenue Galleria location April 1st – April 7th. On April 5th, the ladies will be able to enjoy a fashion presentation hosted by Saks with commentary by local fashion bloggers, test hairstyles and cosmetic looks, and preview their new look in a sample prom photo! Mia’s Closet extends the warmest thanks to Saks Fifth Avenue, and we look forward to creating a once in a lifetime experience for these ladies!